Several months ago, I received a Friend request from a childhood acquaintance. Well, that is not exactly true. We never were acquaintances. We did grow up on the same reservation, we are the same age, we went to the same grade school, but we never spoke to each other. After graduating from 8th grade we went to different high schools, as there was not a high school on our reservation at that time. At some point, I heard that she had transferred to Flandreau Indian School in Flandreau, SD and I never saw her after that. That was 45+ years ago. Other than hearing that she had married right out of high school and moved away, and a few rare discussions, which prompted memories of her I never once thought about her over the years. When she sent a Friend request to my alter ego, Hobo Joe, I not only remembered, but I remembered her as a very pretty girl who was always teasing and giggling. And, a very vivid memory of her soon popped into my head; a teacher was scolding her so I turned around and looked back at her. She had the usual mischievous look on her face and was just beginning to sit in her chair. I recall she was pulling her very short skirt down while she sat down. At first I had no idea why I remembered that scene, now I do - kind of, but I am getting ahead of myself. Because she sent my alter ego, Hobo Joe, a Friend request I thought that is the name she remembered me by. Hobo Joe is the name most people knew me by back then. I soon learned she did not remember me as Hobo Joe, or as Erich Longie either. I found hard that hard to believe. (How could anyone forget Hobojoe lol)? When I received her request, I messaged her and asked her why she wanted to be my friend. It is something I do with most requests I receive. With her I had another reason to be cautious. I had several runs in with her family in the past. In my case I have long let bygones be bygones, but I was not sure about her family. She comes from a close family, just like mine, so I know when you fight with one you fight with all of them. Her response to my questions seemed to confirm my suspicions that she was sensitive about the trouble between her family and me for she wrote, "...I'll just block you than!" I responded by suggesting she settle down, I explained I was simply being careful. Long story short we became Friends. Little did I know what fate had in store for me. What happened next affected my life in way that took this old hard-core bachelor totally by surprise. Some months ago, while browsing Facebook I stumbled across a name that I did not recognize, but the person was from Spirit Lake, North Dakota, my home reservation. At the time, I was trying to connect with the community back home. Most of my relatives lives but seldom discuss news outside the family`. I thought maybe this person would post things about home that I do not hear about. I sent a friend request to Hobojoe Langer a person I did not know. I did recognize the last name since my dad said the Langers were our relatives. I thought I was sending a request to a relative. Hobojoe first asked why I wanted to be friends with him, which I thought was weird. Most people either accept or delete your request. I assumed he was arrogant and fussy about whom he accepts as friends. Being very quick tempered I put up my defenses I said I would block him. But, he was quick to tell me to wait. He told me his real name was Erich Longie. I still did not know who he was. I remembered his younger brother but not him. I remembered the name Erich Longie but I did not remember the person; this is where our friendship began. We messaged each other off and on and after a couple of weeks, I checked out her Facebook page. I was surprised to learn she was single for I knew she had married her high school sweetheart and they moved to his home reservation. I quickly thought... well what most ndn think when a middle age woman becomes single; her husband left her for a younger woman. It was not any of my business so I never asked about her husband. Soon after we became FB friends I learned I was going to be traveling to a city in the state where she lived and I asked her if she wanted to meet me for dinner. She quickly accepted my invitation. I admit I was interested in meeting her after 45 + years, however, I still considered our dinner date as non-romantic. As a committed bachelor, I have lunch with women all the time. I had even invited the consultant I was meeting with the next day to accompany me to the dinner. While we were waiting in the lobby for her I suddenly changed my mind and told him I wanted to eat with her alone. She walked into the hotel lobby like she owned the place, which made a heck of an impression on me. We went to dinner and had one of the nicest dinner conversations I ever had. We talked about events from our youth that we both recalled, although we recalled them differently. It was a very pleasant walk down memory lane, with a woman from another era, the same era I grew up in. We both grew up in the same harsh reservation environment of the 1950's and 1960's. She reminded me of my sisters, mom, my aunties, and other women from back then. She had the same strength, honesty, and no-nonsense approach of women raised in a tough environment. I had the impression, here was a woman who took all what life threw at her, and it only made her stronger. I was impressed. The evening went by all too fast and she had to leave. She told me she had planned to go to Spirit Lake to visit her brothers and sisters and I immediately asked if I could take her for lunch at The View or the Buffet when she came and she agreed. As I usually do I posted about our dinner before I went to sleep. I have dinner with different women all the time, but somehow this one was different. I kept thinking about the warm feeling I had during our dinner. The next day when I when I was traveling home, my mind kept returning to the dinner and conversation and how pleasant it was to be in her company. I very much wanted to see her again. At some point, I checked my Facebook and saw that she had also posted about our dinner. She had called me a gentleman (which no ever does) and said our discussion was like we picked up a conversation we started many years before. I thought that was the perfect description of our exchange. Her post started a warm glow in the pit of my stomach. But, I had a pressing issue at home I knew I had to deal with and I quickly pushed the happiness to the back of my mind. I was on cloud 9 the rest of the week. I told myself to stop acting like a foolish schoolgirl. I was 63 years old and a great-grandmother and what I felt toward a stranger was dumb. 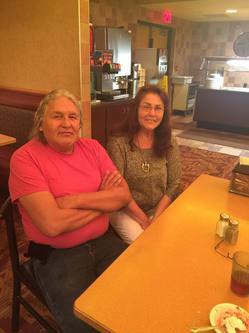 She came home to visit her brothers and sisters and as we agreed, we met at the casino Saturday for lunch. I arrived at the buffet first and got us a table. I saw her walk in and I suddenly became nervous and shy. However, once we were seated I was totally comfortable with her. During the meal at the Dakotah buffet she hinted that she was aware of the problems that existed between her family and I, but it did not prevent us from totally enjoying each other's company. Sunday morning, she messages me and told me she was leaving in a couple of hours. My home was on her way so I almost told her to stop by my house to say good bye. I picked up my phone before I decided not to. I figured I better not push my luck. Regardless, I wanted to see this lady again, but I had my doubts whether it was even feasible for us to get together again. I finally decided to go to Fort Totten to see my family at the end of October. I messaged Erich told him and we made plans to have dinner. When I arrived home Friday, I was so busy with my sisters and visiting that I did not meet Erich for dinner. I messaged Erich the next day and we planned to meet for lunch. Unfortunately, my sisters planned an early sister day the same day. I did not want to miss my lunch date with Erich so I told them I had a date for lunch. When I told everyone, it was Erich Longie I was meeting for lunch a couple of eyebrows went up although no one said anything. At the time, I thought it was because they were all thinking about my late husband. However, when I told an in-law who I was meeting she was shocked beyond belief and I begin to suspect maybe my family did not like Erich. I met Erich at the casino buffet for lunch anyway. I was not disappointed; we picked up right where we left off in Billings. It was an enjoyable hour. The food was okay, but it was our conversation and his company that I found exciting. Before I left I told him the next time he is in Billings he could come to my place for a home cooked meal. To be honest I did not think there was a snowball's chance in hell that I would every take her up on her invitation for a home cooked meal. As much as I enjoyed her company I could not see how it was feasible for us to get together with 600 miles between. I did make a mental note to contact her the next time I was in her part of the country. When I was invited to a meeting in Rapid City I messaged her to ask if her invitation for a home cooked meal was still open. She said it was. Fortunately, the agenda changed after the meeting started. I had some free time during the afternoon. I messaged her and told her I would be there late that evening. She warned me a storm was coming. (This is the first time I told her weather does not factor in to my decision when I travel.) I did not hesitate, I gassed up my truck and headed to Lodge Grass. To be honest it was further than I thought, but the scenery was so beautiful I did not mind. Reservation towns are terrible when you are trying to find someone. I had to call her and she directed me to her home. I was a little apprehensive when I went inside, but she soon made feel at ease. She served me the best home cooked meal I had in a long time. Again, she hinted that she knew that her family did not care for me. This was the third time she mentioned the subject and I begin to wonder when she would stop chatting with me for I knew her bond with her family was strong. Nevertheless, I enjoyed our conversation immensely so I stayed longer than I planned to. Shortly after I left I ran into a mountain blizzard. The visibility and road conditions deteriorated to the point where I wondered if I would be able to make it back to Rapid City. She was aware of the blizzard and messaged me and told me to let her know when I made it back. I was touched that she cared enough to be worried about me. The next day, after the meeting, on the way home I ran into another storm. Again, she messaged with her concern for my safety. Maybe I am finally making some progress I thought to myself. I think it after this trip that we begin to message each other on a regular basis. The first part of November he messaged and wanted to know how far Rapid City was from where I lived. I said about 4 or 5 hours. He said he was going to be in Rapid City for a meeting and asked if my invitation for a home cooked meal was still open? I said it was, he replied he would drive down from Rapid City the next evening. I was excited to say the least. I asked what he wanted dinner? He said meatloaf, or soup, if it is not too much of a bother. I was thinking a bother? I love cooking and for someone who does not care what I cook... even more so. I told my granddaughter everything about our conversation and what he wanted to eat for supper. She said, "Yuck! No... it must be a special meal". She planned the meal and the next day we went shopping. I cooked roast with all the veggies, made gullet and strawberry short cake. I believe we enjoyed the meal. But again, the conversation was what was the best part of the evening. After 2 hours of food and conversation he left back to Rapid City in the beginning of a winter blizzard. Later my granddaughter was wondering why a man would come so out of his way just to eat a meal. During one of our chats she asked me what I was going to do for Thanksgiving. I replied, "I might go to the buffet at the casino". She was aghast. She could not fathom anyone going to a buffet for Thanksgiving dinner. A few days later, out of the blue she invited me for Thanksgiving and I told her I would think about it. Truth was I had no intentions of driving 600 miles for a Thanksgiving dinner. However, I kept thinking about her invitation and a few days before Thanksgiving I decided to take her up on her offer. I wanted to see if the comfortability I felt in her presence was for real. At 5:00 am Thanksgiving Day I loaded up granddaughters Anna and Star in my truck and by 1:20 pm I was pulling into Lodge Grass. It was a great meal. She is a fantastic cook. She had told me her sons were resistance to her dating so when her oldest son politely asked me several questions I was prepared for them and had no problems answering them for I am proud of my accomplishments. Later we sat on the couch together but I felt like a schoolboy around her. I did not even put my arm around her I felt so shy. We left early Friday morning after she cooked us breakfast. I was pleasantly surprised when she gave me an affectionate hug as I was going out the door. While driving down the road I was determined to see her again and the distance between us was not going to matter. We started messaging each more frequently since he came up from Rapid City for supper. It was different to be messaging with a guy, it was exciting and made me feel young again. I was not sure how long our friendship will last but I was hoping it will last for a long time. I did want to get to know him better or at least know more about him. I asked him what he was going to do for Thanksgiving and he said might go eat at the Casino, or one of his kids would bring him a plate. I felt bad that he would be alone during Thanksgiving. I invited him to come share Thanksgiving dinner with my family. He had said he would think about it. We messaged back and forth for a few days and he finally said he would come, but said he would have to bring his 2 granddaughters. I could not believe it! He was going to come to eat dinner at my house. I immediately begin to feel bubbles in the pit of my tummy. I knew I had to make it special for him. I went out and bought my dinner setting for the table, I even bought new center pieces. I became more anxious as Thanksgiving Day came closer, and closer. I wanted everything to perfect for him. I was also scared he would back out at the last minute. I worried every time he sent message wondering if it would say he was not coming. When he got here I tried so hard to be calm an act normal. I heard my son asking him several questions and I felt like a school girl whose father was questioning her boyfriend. After dinner, I really wanted was to be alone with him so we could talk again. There was something about this guy. As the evening came everyone left and it was just his granddaughters, him and I. He got quiet and we just sat not saying much. Him on the love seat and me on the couch. I fixed a room for them to sleep in and we all went to bed. I lay in my room alone thinking; "What in the world am I doing... there is man in my house, a stranger, and I'm here alone". But I also had a good feeling having him here. We made plans for New Year's weekend, but the weather would not cooperate, at least from her viewpoint. For the second time, I told her weather does not interfere with my travel plans and I would be there storm, or no storm. The storm was vicious, but I was not worried, I had driven through plenty of worse storms and road conditions dozens of times for less important reasons. For, her I would have driven through a much, much worse storm. We did not go anyplace to celebrate the New Years. We just sat on her couch and talked until five in the morning. When I left, in bad weather, I wondered, what the hell was wrong with me? This old bachelor was not used to putting forth any effort into seeing a woman. I did not care. I knew I would go back. Later she told me family and friends were asking her, "Why did he drive 600 miles in a blizzard to visit you?" I told her, "The next time they ask that question you should answer with this question, 'Why wouldn't he drive 600 miles in a blizzard to come see me?'" I have never let anything stand in my way when I wanted something bad enough. If I did, I would probably be dead from alcoholism long ago, or I would still be in a wheelchair, or, I would not have received my doctorate, and I probably would be dead from cancer. Driving 600 miles through blizzards and bad roads to see a winyan I care for is nothing to this old renegade when I compared it to the happiness, peace, and contentment, I experience simply by spending time with her. He drove 600 miles through a blizzard to be with me. And, he left in a blizzard. I did not understand why he would drive through a bad winter storm, down here and back, just to be with me. I have since been to her home several more weekends. We do not do anything exciting; mainly we just stay at her home and visit. Her home has become a safe-haven for me; all my worries, my stress, my problems seem to disappear when I am there with her. I do not get bored. In fact, watching her do her chores brings me a contented, peaceful, feeling. We usually take a drive to Sheridan, or Billings. It is a beautiful country and she points out the landmarks and interesting features along the way. A couple of times we ate lunch at some restaurant, or she would ask me what I want for supper and we would stop and pick up the ingredients. These drives are the closest this old Dakota will ever get to paradise. We manage to discuss even the most delicate subjects with respect and consideration. On one of those drives I asked what had happened to her husband. She told me he died in a car accident three years earlier. I sincerely expressed my belated condolences and said this; "You have suffered enough hardships in your life...it may sound strange, but I mean it when I say I wish your husband hadn't passed away. Even if it meant we wouldn't have met." Another time she spoke of how hard it was to move on from the loss of her husband. I took that to mean we never could be close so I told her. "Some women never remarry after losing their husband. If you want to keep his memory close to your heart till you meet him again in the next world, I will respect that. Should that change, I will still be here." Apparently, I misinterpreted her for she did not mean that at all. I assured her I would continue to treat her special. I have taken woman for granted much too long. I am becoming aware of how destructive my cavalier attitude can be when it comes treating women; heck, there is always another one down the road if something go wrong. I think it is time I grew up and I am determined to treat her the like a queen. However, it will take considerable effort for this old bachelor to change his attitude. I'd better if I want to keep this relationship going. With each visit, I become more impressed with her character. 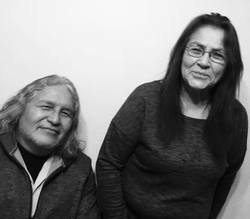 Here was a winyan (woman) who came from humble beginnings, left home at a very early age, assimilated so well into her husband's tribe that its hard tell she is not from his reservation, raised a family, endured tragedy and hardship, but never lost her sense of humor, or became bitter and angry. Quite the opposite, she is one of kindest and most compassionate people I have ever met. Her pride in who she is and her self-confidence is amazing. I could not help but be attracted to this amazing lady and vowed to treat her in a manner that would make up for all the hardships she experienced in life. However, if there is one thing we have learned during our 63 summers on this earth is to, never say never. We are keeping our options open. IS THERE A GREATER FORCE AT WORK HERE? Were we fated to meet? We are beginning to think so. We talked about it several times and there are just too many coincidences for our meeting to be accidental after 45+ plus years. While we do have one mutual Friend she cannot remember exactly how she came across my name. And, once she sent me a Friend request the memory of the teacher scolding her and her sitting down while pulling down her skirt came back clear as a bell. Was it a coincidence that I change my mine at the last minute and told the consultant I wanted to have dinner with her by myself? And, to repeat what she said, everything seemed so natural between us. I think she said it best, "The Creator picked this time in our life for us to be together". I am beginning to believe her. After my youngest son graduated from high school I did not have the freedom I envisioned I would have. First, Anna banana was born and I was soon raising her, then I was awarded custody of Sunny and Star. Finally, I tried to save my son and his girlfriend from meth. Before I knew it, I was on the wrong side of 60, but it did not bother me too much. Eight years ago, when I was told I had cancer and had five years to live I had made up my mind I was going to go to the Spirit World as a single man. While I enjoyed the company of women I had no plans to become romantically involved with any of them. I am fortunate to have met a beautiful woman who is the same age as I am who. Who grew up on the same reservation, faced the same challenges, and who shares similar values. We also have mutual admiration for each other, she takes care of two grandchildren as I do, she had cancer, and I still do. I do not feel any pressure or jealousy when I am with her because I highly respect her integrity and honesty. I can say with certainty I treat her better than other women I have been with. This new-found maturity makes me open to whatever the future may hold for us. I'm never going to let her go."